Telisa Boston lost her right arm at the age of 16 to a Tumor. Since the amputation, Telisa wore prosthetics to do her everyday tasks. She continued on to become a Public Relations and Sales Professional for a Dental assistant. Now, she might get a newly functional arm – of sorts. Enter Biodesigns, inc., which is a high-performance Southern California prosthetic facility. They specialize in upper and lower extremity care using advance technology. They determined Telisa was a candidate for this “myoelectric” solution. Myoelectrics basically means “muscle electronics”. 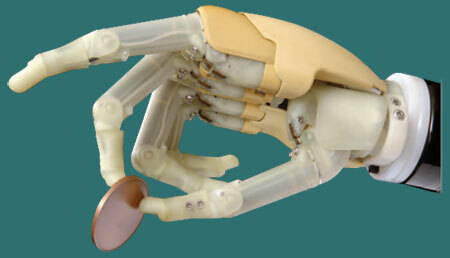 Biodesigns created a “compression-stabilization system” – which is a way to make the hand close around objects with a more natural movement. While she wont be typing 60 words a minute anytime soon, Telisa will be able to do things that she had to limit to her left hand. Picking up objects, opening doors or bottles or anything of the like. I remember a story about a Saxophone player that lost his arm years ago. He worked with a team and they developed a prosthetic that used the muscles in the remaining limb to instruct the prosthetic to open and close the valves. I thought at that time it was a great advancement to help a musician play his instrument once again. While prosthetic technology wont replace full functionality just yet, it might just give the user a new lease on life and bigger range of functionality. My Dad, for example, had his right leg amputated after a long infection. Interestingly enough, when he was young, he had polio, which left him at a slight limp. After the prosthetic, he wasn’t running, but he wasn’t limping either and he was even more mobile than before the infection. We wish Telisa luck with her new limb. It looks like a great new technology that will hopefully propel artificial prosthesis to a new level.